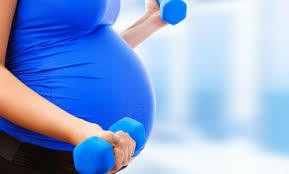 We know that exercising during pregnancy is good for both mom and baby -- from boosting your energy and sleeping better, to reducing the risk of gestational diabetes and joint pain. Still, the current pregnancy exercise guidelines are vague at best. Here's the breakdown. We know that exercising during pregnancy is good for both mom and baby -- from boosting your energy and sleeping better, to reducing the risk of gestational diabetes and joint pain. Still, the current pregnancy exercise guidelines are vague at best. "Warm up, keep your heart rate under 140 BPM, stay off your back, avoid dangerous sports and stay hydrated" pretty much sums it up. I remember taking my first pre and postnatal certification course years ago, and the guidelines were just as generic. I was disappointed as a fitness professional, especially one yet to have kids. There had to be more guidance. Pregnant women in gyms were uncertain as to what was safe that they often quit working out all together. Those who did persevere with their regular classes often received no direction other than "take it easy" while trying to self-modify the group exercises. So naturally I nerded out and learned everything possible about pre and postnatal fitness. From interviewing PhDs in women's health and becoming a Labour Doula, to taking three different courses on diastasis recti, a.k.a. 'mummy tummy'; the separated connective tissue that leaves many postpartum moms with flabby bellies and a compromised core. The search for a better pregnancy workout led me to discover pelvic floor physiotherapy. It turns out that a functional pelvic floor is pretty much the most important thing ever. Want to prevent pregnancy back pain and reduce your risk of mummy tummy? Want your body to bounce back after you deliver your baby? Want to avoid organ prolapse and incontinence? It comes down to keeping your pelvic floor -- the base of your torso and centre of your stability -- strong. It comes down to your "kegels," and whether you're doing them right (hint: most aren't). Here's how pregnancy and the pelvic floor works: picture a bowling ball (your baby) bouncing on a trampoline (your pelvic floor). As the ball gets bigger and heavier, your trampoline needs to keep up with demands. We need to ensure the trampoline is strong enough (not too taut, not too lax) to support things properly. Unfortunately, telling women to do their kegels just doesn't cut it. Goal: Connect with your deepest layer of abdominals (the transversus abdominis) before this muscle stretches out from the growing baby in the second trimester. Learn how to breathe using your diaphragm to help manage hormonal related dizziness and nausea. Make it a priority to take care of yourself. Try coming from a place of self-kindness. Too often the message we internalize around pregnancy is one of self-criticism and competition to "get your body back fast." This mindset leads to negative self-talk and frantic stroller baby bootcamp injuries. We either give up with a defeatist attitude and do nothing, or punish our bodies back into our skinny jeans. Either way, our body suffers. Let's find some middle ground and work not only on that pelvic floor abdominal connection, but on that positive mind body one too. Anne Vyalitsyna is expecting a baby boyfriend Adam Cahan. Naya River and husband Ryan Dorsey are expecting their first child together. Kristin Cavallari is expecting her third child with husband Jay Cutler. Eric Decker and Jessie James Decker are expecting baby No. 2. Brooklyn Decker is pregnant with her first child. Tamera Mowry-Housley is expecting a baby with husband Adam Housley. Jamie King is pregnant with her second child. Alec Baldwin and wife Hilaria Baldwin are expecting their second child together. Zooey Deschanel is pregnant with her first child. Jennifer Love Hewitt is expecting her second child with her husband, Brian Hallisay. Newlyweds Ashlee Simpson and Evan Ross are having their first child together. She is also mom to 6-year-old Bronx. The former Victoria's Secret model is pregnant with her second baby with husband Griffin Guess. Haylie Duff and fiance Matt Rosenberg are expecting a baby. "Bachelor" and "Bachelorette" star Emily Maynard is pregnant with her second child. The supermodel is pregnant with her second child. Benedict Cumberbatch's fiancee, Sophie Hunter, is pregnant with their first child. The actress and her husband, James Righton, are expecting their first child together.